Training missionaries in the tropical downpours of Chiang Mai, Thailand . . . Setting up a MASH unit in rainforests . . . Propping a patient on bags of corn in the Ecuadoran mountains to perform dental care illuminated by a flashlight . . . Inhaling the aroma of lemon trees from the balcony of a 19th-century villa in Florence, Italy . . . Staring down at the Chinese city of Shanghai through the glass floor of the Oriental Pearl, some 200 feet above ground . . . These were among the once-in-a-lifetime experiences of several College of Dental Medicine students and faculty over the past few months. Opportunities for international education and volunteerism have never been more abundant in the college than now, says Dean Carol Lefebvre. 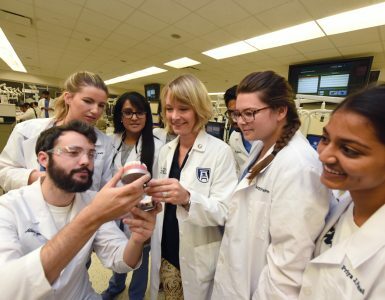 “We treasure the importance of global experiences, believing that students return from the educational trips with an enhanced appreciation of the international similarities of the dental profession and an elevated understanding of the cultures so different from their own,” she says. GRU dental student Andrea Pierce, who participated in a student-exchange program in China last year, concurs. “My China tour is truly one I will never forget,” she wrote in an essay detailing the trip, which included visits to Hong Kong, Shanghai, Hangzhou, and Beijing. It was in Hangzhou, for instance, that she observed hospital-based dentistry complete with a nascent immersion in implants and one-at-a-time tooth extraction with doses of antibiotics both before and after the procedure. Study was interspersed with fun and cultural immersion, she says, including a toboggan ride down the Great Wall of China. 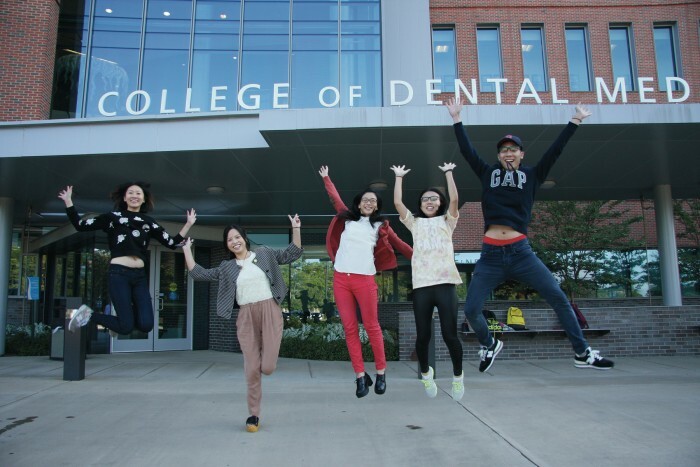 This kind of exposure is precisely the goal of the College of Dental Medicine Student Exchange Program, according to Dr. Franklin Tay, Chairman of Endodontics and Director of the program. And opportunities are growing. 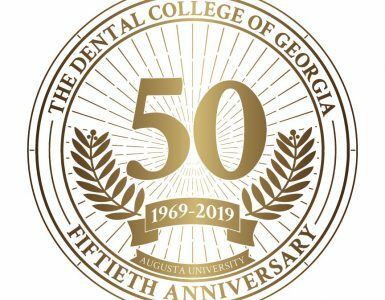 The college recently received a $3,750 grant from the International College of Dentists-USA Section Foundation for the program. “We have exchange programs with schools in China, Egypt, France, Italy, and Saudi Arabia and are working on a new program with a dental school in Ecuador,” Lefebvre says. 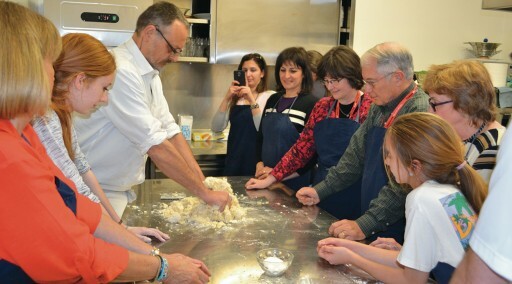 Combining the fun with a continuing-education course, she says, was nothing short of exhilarating. Says De Rossi, “We held classes in the mornings and had excursions in the afternoons,” including cooking classes and museum visits. 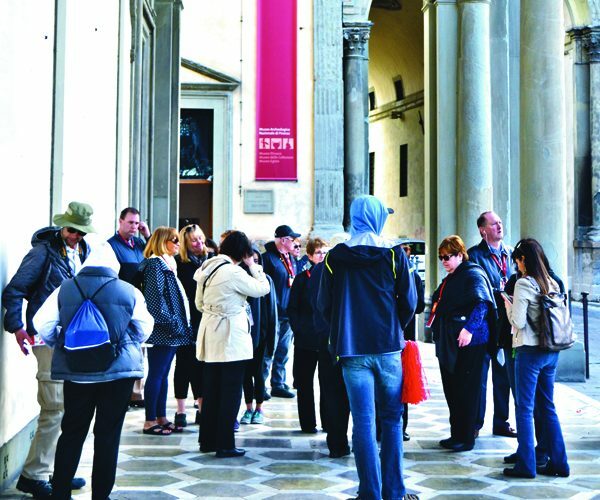 Speaking invitations offer still more opportunities for GRU faculty to spread their expertise worldwide. For instance, Dr. Ulf Wikesjö, Professor of Periodontics and Oral Biology, discussed bone tissue engineering at the Grenoble Institute of Technology in Grenoble, France, recently and attended a meeting of the Nobel Biocare Annual Expert Advisory Board in Feusisberg, Switzerland. Of course, dentists’ most valued resource is their clinical skill – and that asset, too, is put to excellent use throughout the globe. College of Dental Medicine faculty, students, and alumni frequently participate in mission trips and other volunteer efforts in underserved areas of the world. Vice Dean Kevin Frazier, for example, has climbed the mountains of Ecuador and ventured deep into tropical rainforests, among other locales, to treat some of the globe’s neediest citizens. “You’re literally setting up little MASH units and improvising, providing care for people who have no options besides you,” he says. Frazier, who majored in anthropology as an undergraduate, enjoys not only serving others, but learning from their cultures. He also broadened his experiences by seeing the results of various lifestyles on oral hygiene – rampant tooth decay in Haiti, for instance, due to extensive consumption of sugar cane, and tooth wear in Ecuador stemming from a coarse natural diet. Frazier shared his skills in a different way when he traveled to Chiang Mai, Thailand, this past spring for the 35th annual Christian Medical and Dental Associates’ Continuing Medical and Dental Education Conference. Serving as a teacher this time rather than a clinician, he acknowledges it felt odd to board a plane without medications and dental instruments. 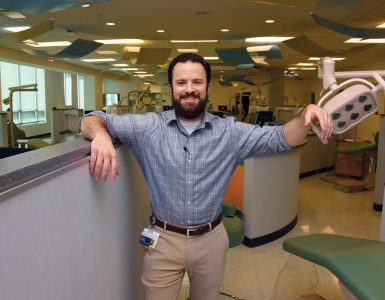 But as he worked alongside Department of Oral Rehabilitation Interim Chairman Kevin Plummer in providing continuing education to missionary dentists, he realized he was rolling up his sleeves in an equally important way. “Instead of delivering treatment, I was teaching providers new and efficient ways to treat patients,” he says. And he cheerfully adds that the trip was not without its exotic touches. “I got a little nervous when two elephants wrapped their trunks around me to give me a hug and a kiss,” he says with a laugh. Dr. Van Haywood, Professor of Oral Rehabilitation, has participated in three of the Thailand trips and one in Greece. He muses that international travel somehow makes the world both bigger and smaller simultaneously. For instance, he served on a mission trip with Dr. Kent Brantley, an American aid worker who recently made international headlines while recovering from Ebola after contracting the disease in Liberia during the deadliest outbreak in history.